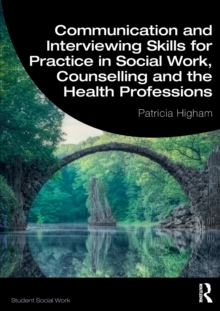 This book supports and develops the communication and interviewing skills of professional practitioners and student practitioners in social work, counselling, and the health professions. Combining work on personal and social constructs, Frankl's search for meaning, and Bronfenbrenner's ecological theory, this book both provides an integrated discussion of practice and presents a balanced approach when discussing psychological, biological, and social influences on individual well-being. Furthermore, it emphasises the influence of social contexts on behaviour and well-being, as well as valuing and encouraging the application of practitioners' prior experience and learning (APEL) to new knowledge and understanding. Containing a range of practice examples to stimulate learning, this book promotes a collaboration between the professions, and welcomes the contributions of people who use services, patients and clients. Communication and Interviewing Skills for Practice in Social Work, Counselling and the Health Professions will be of interest to all undergraduate and postgraduate social work students, as well as new and experienced professional health care practitioners.